UPDATE (July 17, 2015): See Domain Mondo: ICANN dot AFRICA IRP: WHO Redacted WHAT In the Final Declaration? ICANN shall reimburse DCA for the costs of the IRP as set forth in paragraph 150 of the Declaration. Resolved (2015.07.16.02), since the Board is not making a final determination at this time as to whether DCA's application for .AFRICA should proceed to contracting or delegation, the Board does not consider that resuming evaluation of DCA's application is action that is inconsistent with GAC advice. Resolved (2015.07.16.03), the Board directs the President and CEO, or his designee(s), to take all steps necessary to resume the evaluation of DCA's application for .AFRICA and to ensure that such evaluation proceeds in accordance with the established process(es) as quickly as possible (see Applicant Guidebook at http://newgtlds.icann.org/en/applicants/agb for established processes). Resolved (2015.07.16.04), with respect to the GAC's consensus advice in the Beijing Communiqué that DCA's application for .AFRICA should not proceed, which was confirmed in the London Communiqué, the Board will ask the GAC if it wishes to refine that advice and/or provide the Board with further information regarding that advice and/or otherwise address the concerns raised in the Declaration. Resolved (2015.07.16.05), in the event that DCA's application for .AFRICA successfully passes the remainder of the evaluation process, at that time or before, the Board will consider any further advice or information received from the GAC, and proceed as necessary, balancing all of the relevant material information and circumstances. Should the Board undertake any action that may be inconsistent with the GAC's advice, the Board will follow the established process set out in the Bylaws (see ICANN Bylaws, Article XI, Section 2.1). See also: ICANN announcement re above Board action. UPDATE (July 15, 2015): ICANN has called a Special Meeting of its Board of Directors for July 16th, with the Agenda indicating only "DotConnectAfrica Trust (DCA) v. ICANN IRP Final Declaration" and AOB (all other business). Did ICANN Staff help a favored new gTLD applicant? See: Unredacted: ICANN's hidden role in fierce battle over .Africa rights • The Register by Kieren McCarthy. Question: Does ICANN have an organizational culture of impunity, making it unfit for global internet governance? One answer here. ICANN has already entered into an agreement with ZA Central Registry for the .AFRICA string but it has not yet been delegated. 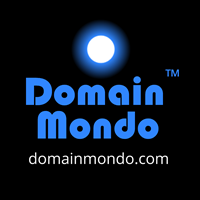 What happens to new gTLD .AFRICA? IRP ¶133. "Pursuant to Article IV, Section 3, paragraph 11 (d) of ICANN’s Bylaws, therefore, the Panel recommends that ICANN continue to refrain from delegating the .AFRICA gTLD and permit DCA Trust’s application to proceed through the remainder of the new gTLD application process." "Consistent with ICANN's Bylaws, ICANN will carefully review the [IRP] panels [sic] declaration and the ICANN Board will be asked to consider the matter at its next meeting on 28 July 2015." What will happen on and after July 28th is unknown. Quoting from IRP ¶143: "... this case was extraordinary and ... 'was in many senses a first of its kind.' 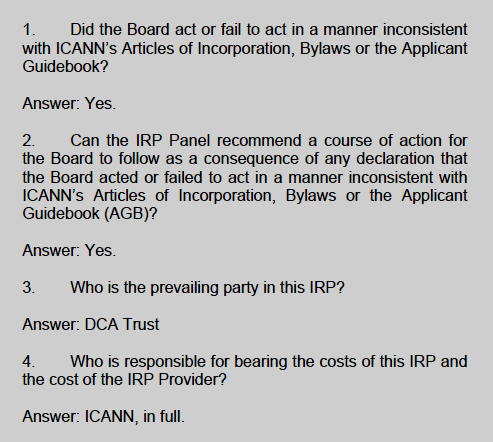 According to ICANN, among other things: This IRP was the first associated with the Board’s acceptance of GAC advice that resulted in the blocking of an application for a new gTLD under the new gTLD Program; this was the first IRP associated with a claim that one or more ICANN Board members had a conflict of interest with a Board vote; and this was the first (and still only) IRP related to the New gTLD Program that involved a live hearing, with a considerable amount of debate associated with whether to have a hearing." ICANN set aside funds for new gTLD legal costs--How much has this IRP cost ICANN so far? IRP ¶144." ... the Panel is unanimous in deciding that DCA Trust is the prevailing party in this IRP and ICANN shall bear, pursuant to Article IV, Section 3, paragraph 18 of the Bylaws, Article 11 of Supplementary Procedures and Article 31 of the ICDR Rules, the totality of the costs of this IRP and the totality of the costs of the IRP Provider." It is likely ICANN's total costs and expenses, including its own legal fees, of this IRP will be in the millions ($US)--just the IRP panelists’ compensation and expenses total $403,467.08 ($US) and "shall be born entirely by ICANN" (IRP ¶150), but ICANN does not have to pay DCA Trust's attorney fees (IRP ¶151). Who are the "other" losing parties as a result of the IRP Declaration? Although sections of the IRP Declaration are heavily redacted, it is clear from reading the Declaration and its recitation of DCA Trust's averments that there are others, besides the ICANN Board of Directors, who share, directly, the "blame" here--ICANN staff, Governmental Advisory Committee (GAC), and perhaps others purportedly acting in support of the other applicant for .AFRICA, ZA Central Registry, which will now likely face a further delay in delegation of the .AFRICA string, if not outright rescission of its Registry agreement. From the IRP Declaration (reciting DCA Trust averments, p.24): "Finally, the Board’s failure to inquire into the actions of its staff, even when on notice of the myriad of discriminatory actions, violates its obligation to comply with its Bylaws with appropriate care and diligence." The ramifications of the DCA Trust IRP decision even extend to the IANA Stewardship Transition and Enhancing ICANN Accountability processes, particularly since the CWG-Stewardship (Names) proposal has dependencies upon the outcome of the CCWG-Accountability WS-1 work, including, possibly now re-writing all bylaws, including provisions dealing with IRPs and GAC "advice." The ICANN Board of Directors is going to have to become "proactive"--questioning (and holding accountable) all ICANN officers and staff, as well as all SO/ACs and their so-called "consensus" advice or recommendations, bearing in mind that the Board's duty is to act in the public interest at all times, the "public interest" defined as what is in the best interests of the global internet community NOT just special interest groups or "stakeholders" within ICANN. This Public Interest Standard should be the standard by which the Board makes all its decisions. The "buck stops with the Board"--everyone should hold the ICANN Board accountable (if you can't stand the heat, get out of the kitchen)--and the Board should hold itself, ICANN officers and staff, and ICANN's own constituencies accountable. In the final analysis, the loser in the DCA Trust case was the entire governing and operating structure of ICANN--from the GNSO which propagated an ill-conceived, misbegotten new gTLDs policy, to ICANN officers and staff who "horribly implemented" the new gTLDs program, to the GAC and other constituencies who failed to stop, object, or otherwise contributed to the dysfunction which resulted in this IRP declaration--including the US government, NTIA, which failed in its oversight role. All of ICANN, however broadly defined, failed the global Internet community. Where from here, particularly in light of the IANA transition? CCWG-Accountability is struggling with that now, and will meet face-to-face in Paris, July 17-18. Stay tuned.